Regarding measuring plastic film thickness, there are three main ASTM standards to consider. These three standards can be used in different situations depending on the user’s goals and objectives. E252 is often referred to gauge by weight, and in the United States, film is often sold on roll weight. In this method, average film thickness can be calculated using the material’s weight, density, length and width using the equation below. This is considered the real average thickness of the film. One of the main limitations is that it is time consuming and difficult to use to obtain the variability of the film. As film samples get very small or very large, it may be difficult to measure their cross-sectional area accurately. Another common method for determining film thickness is using a micrometer, and this method is described in D6988. Micrometers are relatively inexpensive, and the concept behind them appears simple, but measuring plastic film creates a number of issues. With thicker films, many of these issues are not as big of a problem, but with thinner films, micrometers present some serious limitations. One of the most serious problems is the precision and bias of the reading. Since plastic films are often under 1 mil (25 microns) thick, and a good micrometer has a precision of +/- 0.05 mils, the micrometer in many cases is only precise to +/- 5% of the material thickness. The precision gets worse on a percentage basis as a film gets thinner, and films under 1 mil thick are fairly common. When looking at the bias, a compression of 0.03 mils, is 3% of the overall material thickness. This is illustrated below. D6988 does not make a precision or bias statement since there are so many factors to consider. The user can test for and determine the bias, and then try to account for it. Otherwise, they are making their material 3% too thick, and this is a serious loss in some industries where profit margins are under 10%. Other practical issues with using a micrometer include dirt getting on the probe, the speed of the measurements, and possible poor reproducibility from operator to operator. D6988 is best for films over 2 mils thick that do not need a comprehensive profile performed. D8136 is the latest standard and applies a more advanced technology which can incorporate D6988 or E252 as a calibration method. This method solves many of the problems of D6988 because it uses a device with at least 10 times the precision, and it does not compress the film to cause a bias in the reading. The standard has a procedure for spot measurements as well as film profiling. It is utilized the plastic film QA lab, on the production floor to assist production or for incoming product inspection. 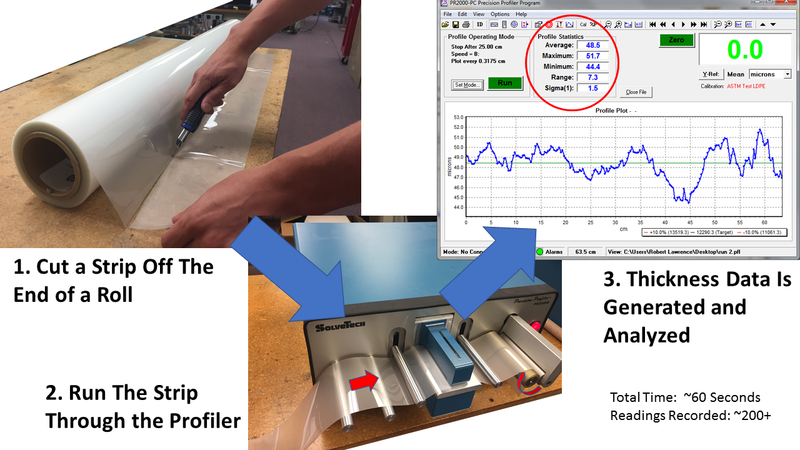 Most commonly, this technology is used for profiling film since this provides the user with an understanding of what the variability profile of the extrusion looks like. This information is important when setting up an extrusion die and when determining if the material is meeting the variability requirements specified. Regarding the bias issue, the D8136 uses E252 to NIST traceably calibrate the device. The downside of using D8136 when compared to using E252 for average thickness is that you are only typically sampling one strip out of the roll. When comparing D8136 to D6988, D6988 makes sense when doing rough average thickness information and taking quick spot measurements. D8136 is better for providing detailed profile scans that determine if the film is meeting average thickness and variability requirements. D8136 also eliminates the issues of dirt getting on the probe, the speed of the measurements, and poor reproducibility from operator to operator. The PR2000 Precision Profiler fully complies with ASTM standard D8136. 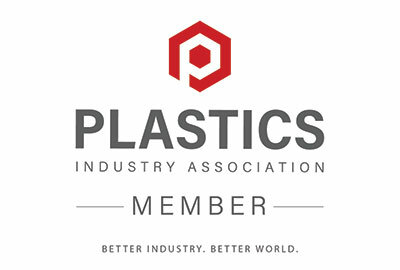 D8136 is also useful when communicating between plastic film buyers and sellers. Since the test method is precise and reliable and it defines film variability profiling, it can be used to set meaningful specifications for average film thickness and thickness variability. Interested in learning more or have questions? Contact us here. SolveTech’s leadership are ASTM members and contribute at to committee D20.19.